Tsunami Tandems - a great alternative for Spring and Fall trolling on the Bay. 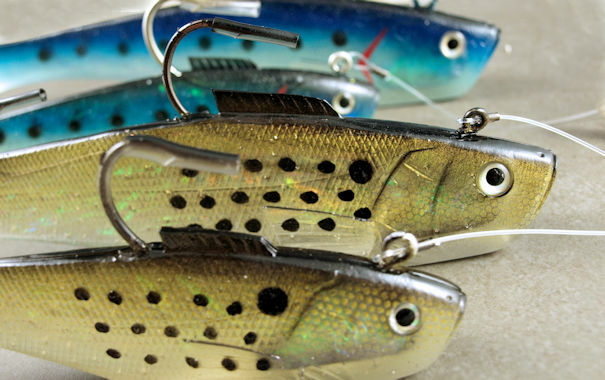 Tsunami's holographic swim shad have tremendous action as a trolled lure. Set them up as tandems as you're chances are even better. We rig them with a three way swivel and 80 pound test line - all crimped. Easy to care for, easy to store and pretty much immune to jelly fish slime. and the deeper diving heavies available in 6.5" and 5"
The holographic patterns are second to none and the tougher material formulations hold up well season after season. Tsunami Tandems - 7" & 5"
Tsunami Tandems - 9" & 7"
Vinyl & Mesh Lure Bag 10"x10"